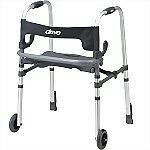 Designed with a durable, lightweight aluminum frame weighing only 14.5 lbs, yet supports users up to 300 lbs. Folds quickly and easily. 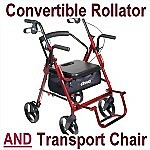 Universal seat height folding rollator includes seat height adjustment from 18" to 22" and includes a padded seat, fold up and removable back support, and 6" wheels. 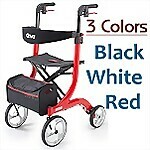 Lightweight Aluminum Rollator featuring easy folding, 6" Casters, padded seat, removable padded backrest, loop lock brakes and more. 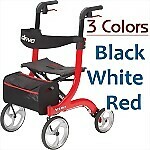 Envoy 480 Rolling Walkers include 8" wheels, deluxe padded seat and curved backrest for comfort, loop style brakes, and pull-up handle on seat for easy folding. 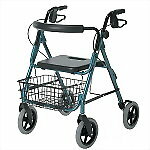 Deluxe lightweight rollator includes 8" oversized wheels for increased mobility, locking handbrakes for sitting, padded seat & backrest for comfort, and convenient storage area under seat for storing personal items. Lightweight 15 lb. 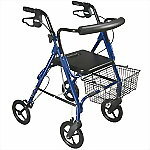 folding aluminum rollator includes 6" wheels, special loop lock brakes, padded seat with removable backrest and adjustable height handles. 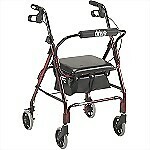 Attractive, Euro-style designed Hemi Rollator is ideal for users under 5'2" tall. 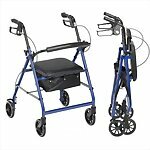 Includes easy one-handed folding, zippered storage bag, 10" front castors, 18" seat height, and handles adjustable from 28" to 31". 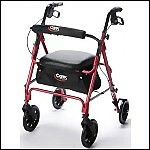 Attractive, Euro-style designed Rollator is ideal for users over 6-feet tall. 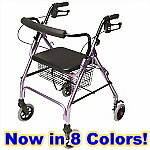 Includes easy one-handed folding, zippered storage bag, large 10" front castors, 23.6" seat height, and handles adjustable from 36" to 41". 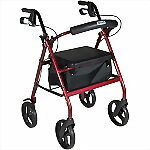 Aluminum rollator (19 lbs) includes 8" wheels, ergonomic handles, plastic seat with easy one-handed folding, and loop-lock brakes. Available in 3 colors. Rollator and Transport Chair in One!This innovative combination rollator and transport chair allows an individual to ambulate independently or be pushed safely by a caregiver. 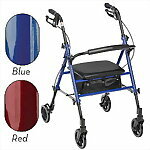 Specially designed folding walker includes 5" front fixed wheels and rear glide caps, a convenient flip-up seat with soft, flexible backrest, and convenient push-down brakes for security. 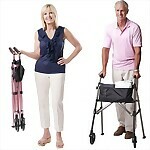 This innovative folding walker features 5" front "fixed" or "swivel" wheels for easier mobility, flip-up seat with soft, flexible backrest, and loop locks for added safety and security. 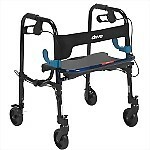 This innovative folding walker features 5" front "fixed" or "swivel" wheels for easier mobility, flip-up seat with soft, flexible backrest, loop lock brakes, and accommodates smaller users with lower adjustable seat and handle heights.